Ginger ale is one of the soft drinks you will always find in my fridge. I keep airline size tins of the sugar free variety available in South Africa. This is a great mixer for rum, and a drink perfect for when you have a sore throat. I have used it here to make ginger ale scones for International Scone Week 2016. When I moved into the first home I owned I bought myself a new fridge / freezer. It was sized for the space that existed in my kitchen and was perfect for one person. When we moved into the cottage it was placed under the stairs and by that stage was fairly old. It is not really suitably sized for 2 people who like to entertain but we did not have the budget to replace it. Eventually we could afford to buy a new unit and we chose a side-by-side fridge / freezer. The white fridge (as I call it) was moved into the ‘lounge’ and was put to good use storing all the drinks and bottled condiments. The freezer section was used for vodka and schnapps and the cray fish caught by Dave during season. Last year we had a lot of power outages – called load shedding in South Africa. This resulted in my freezer giving up its ability to do its job! In the hope of saving the contents Dave turned the unit to its coldest setting. In the short term this worked for the frozen shellfish, but it did not work so well for the cold drink tins in my fridge. The tins of ginger ale froze and one of them burst. In order not to waste the beverage, I made ginger ale scones using Celia’s recipe for lemonade scones. I know this recipe is a huge hit by all the comments. I agree that the ginger would warm you up and be just perfect in this scone. brilliant – I actually thought of ginger scones for ISW because I have wanted to try the ginger scones on passionfruit kitchen that were posted last ISW – and I love ginger ale – it is often my fizzy drink of choice. But I went savoury and hope to post the recipe soon! Just did my scone recipe and then saw that I am way behind – I had the ISW dates totally wrong in my head. Life has been distracting! If you are up to accepting late entries, that would be lovely, but if not that is totally understandable. The link will be under my comment. Ooh, I love ginger, but hadn’t thought of doing this. Some finely chopped crystalised ginger would really beef up the flavour too! I’d love to try these. Never thought to add ginger ale but it makes so much sense. I use soda water with lemon in my scones…so kind of like lemonade scones. thanks for hosting. love the simplicity of your ginger ale scones! We have a second fridge/freezer in the garage and it is full of beverages too. Luckily no exp,doing ginger ale! These scones look scrumptious, such a classic that would go well with all the homemade jams I’m overwhelmed with right now. I love home made jams! do they taste like ginger ale? or is it a subtle taste? Yum, I love ginger ale but never even consider baking with it — now I have to try it! Very thrifty. Similarly, I had a bottle of open ginger beer that I turned into scones, using a lemonade scone recipe. Thanks for adding me to the link up. Ooooh, I have not tried making scones with ginger ale. Lovely! I think I should try the cocktail route next! Clever use of the ginger ale Tandy, your scones look delicious! Ha ha great use of an exploded tin of Ginger Ale. Not a fan to drink but in a recipe would be good, so fun in scones. I could not throw it out! I’ve never made scones like this -awesome use of ginger ale! Thanks so much Tandy! I am so in to scones at the moment, especially with some cherry jam. A ginger version sounds delicious too. Now I have to make some cherry jam! It sounds delicious. I am a fan of ginger ale and would love to try these scones. I like ginger ale but never had scone made using it. Would love to try it next time I buy ginger ale. I love the idea of ginger ale scones! So creative. Not a big soda pop drinker here, but yes, you can always find ginger ale in my fridge too. Especially when you have an upset stomach. It does the job!! 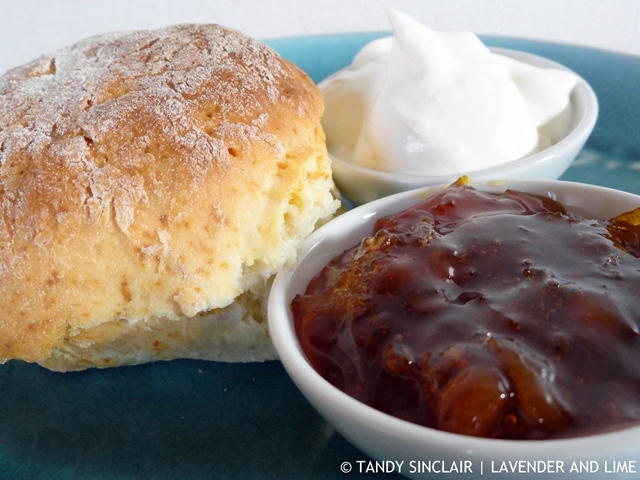 Still my favourite recipe for scones – must definitely try ginger ale.